Touch ID and the iPhone fingerprint reader has been around for a while now, but a great feature that seems to not get much use is the ability to unlock an iPhone with a touch and a fingerprint – that means not having to enter the passcode when you want to unlock the iPhone. Instead, you just rest your finger or a thumb against the Home button, and the screen unlocks automatically. Whether some users have this Touch ID feature turned off, have trouble with the feature working as intended, or simply don’t know it exists, who knows, but it’s easy to set up and it does work quite well if you use a particular trick to improve the fingerprint recognition. With that in mind, here’s how to get fingerprint based unlocking enabled and, perhaps more importantly, working reliably well so that it will unlock on every attempt. 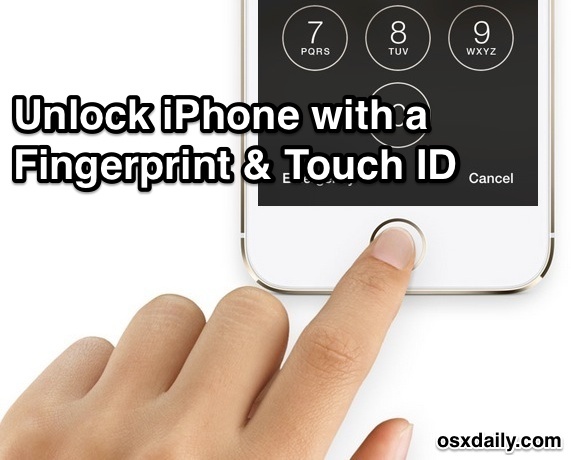 Note: you’ll obviously need an iOS device that has Touch ID support and a fingerprint reader for this to work. As of now that’s the newest model iPhone and iPad models that have the Touch ID feature built-in, and surely all devices from here on out will include the feature too. Once you have the fingerprint unlock feature enabled, you’ll want to be sure you have the fingerprints registered with Touch ID that you regularly use to wake the screen and unlock the iPhone. For me, that’s my thumb, but for some users it could be a pointer finger, middle finger, or whatever else. Exit out of Settings when you’re finished or you can instantly try it out by locking your iPhone and testing it out again by just holding the finger over the Home button Touch ID sensor. With the same finger added multiple times but at slightly different angles, it should perform much better. 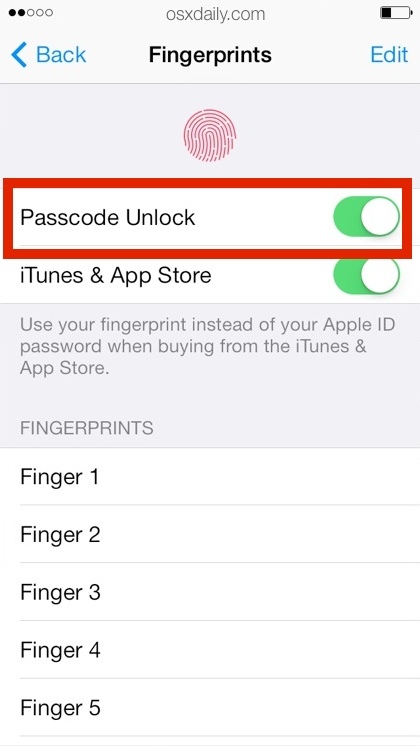 To be clear, this does not stop the iOS passcode feature from working or disable it, you can still enter the passcode to unlock the device if you want to. In fact, if the Touch ID sensor fails to recognize a fingerprint, or if you haven’t used the TouchID feature in a few days, you’ll have to use the normal passcode to unlock the iPhone anyway. Touch ID is gimmicky, I’ve added my thumb as all 5 fingers and it still takes longer to unlock with a fingerprint read than it does to just tap in a passcode. And now Touch ID will be on iPhone 6, iPad Air 2, maybe even the new Macs… ugh, a resounding ‘who cares’, maybe if it worked better? @Andy Grats: Unlocking my iPhone 5S with Touch ID is literally instantaneous and I’ve only added two fingerprints (my thumbs); it’s most definitely quicker than entering a four-digit passcode. I’m bemused as to why it takes so long to unlock your iPhone 5S using Touch ID – is it failing to recognise your finger prints or is it possible that you’re somehow making the procedure more complicated than it should be? Finger print authentication has been on some of my favorite non-apple laptops for years. ThinkPads had evolved it very well to support hardware level locks and full disk encryption… wrapped all around your finger print. Once I could power up my laptop from full locked to a desktop with the swipe of a finger (and a TFA code if required by corp security) that was a win for everyone. On the phone, yeah it’s a bit gimmicky – but for a rev1 product it works as well as a pass code. The TouchID sensor implementation reminds me of Apple’s USB “hockey puck” mouse that was a complete failure as it lacked orientation. In contrast the swipe sensors used by ThinkPads and even HP PDAs over a decade ago aligned your finger. Perhaps you should learn to follow setup instructions. I purchased a 5s the day it was released and setup my touchID as directed. 3/4 of the way into an individual fingerprint setup, you are instructed to begin rotating the same finger and touching the button from different angles. (The idea of imprinting your primary finger as a different print; with a completely different orientation sounds like it might assist as well). Regardless; I have had a success rate of about 99% on first attempt since day one. There are some individuals who will experience problems with TouchID; as well as any other fingerprint scan technology. One of my coworkers used to be in the Navy and regularly worked with semi-caustic, abrasive cleansers. His fingertips are now almost completely smooth. We have a biometric time clock system for payroll calculation. It will never read his fingerprints; so he has to use the numeric keypad backup. BS. I only trained a single finger once the day I bought my 5s. I’ve never had to re-train it and it always unlocks no matter what orientation I place my finger on the sensor. Do you even have an iPhone? Make sure the fingerprint scanner is clean before you register prints. I was recently having problems with Touch ID—my phone seemed to no longer recognize any of my fingers. I thought it was just another software issue, but then I realized my home button was covered in grease from my fingers. Once I cleaned it off with isopropanol, registering and subsequent reading of my fingers works just fine. I love Touch ID. I never have any trouble with it, unless my finger is somehow altered, i.e., just out of the shower. I can’t wait until they open the API and allow other apps to use it. It also allows me to use a long passphrase instead of a 4-digit PIN. Thanks. This really did improve reliability and responsiveness. Tip: Set it up for at least two fingers. Then if you injure one finger you can use a different finger as a backup. I have very strange results with mine. For about 4 months, I had zero issues, would unlock 99% of the time on the first try. Then it just stopped. Stopped even trying to read my print from what I could tell. I wouldnt get the shake / incorrect passcode when scanning, id wake my phone, put my thumb on, and it would just sit there and then go dim at the normal screen timeout. I cleaned the reader, rebooted, everything. Then about a week ago, it just started working again. I would say in the last week it has been aroun 80% reliable the first time. Occasionally it goes back to acting like its not even trying to read it. Mine just started doing that too. I was having no problems at all. Then all of a sudden the phone acted like it wasn’t there. And when I put in my passcode it would take about 5 seconds to unlock. At some point it would say passcode is required after reboot when I didn’t reboot. The slow unlock goes away when I turn off the fingerprint unlock in settings. But I want the scanner to work! I really don’t want to restore my phone for this either. Especially if it isn’t going to help at all. Had no problem with finger print ID and use it all the time. Very quick. On the other hand we use a similar system at work to sign in and it never works for me. It’s all to do with the quality of the product. I can’t speak about the iPhone, but I assume the ID system is the exact same found on the iPad Air 2. I think it’s not really necessary to record the same thumb in different angles. I’ve recorded the 2 fingers of each hand (index and thumb) and it always works flawlessy both in landscape and portrait mode. Probably because I tend to place them let’s say ‘in a natural way’ always with a similar angle. Maybe another a tap and slide sometimes and it works at the second try. Probably it has something to do with the thin extra layer added by the grease. The only times I’ve had problems with the sensor on my 5s are when either the sensor or my finger have been cold or wet… once that’s been corrected I have had no problems. I set up fingerprint last night on new 6plus but didn’t enter a passcode at the time. Now I’m locked out because my thumb was cold when I tried unlocking earlier. Suggestions? Is there a default passcode or something? Phone store or do I have to go to apple store if I can’t fix it?